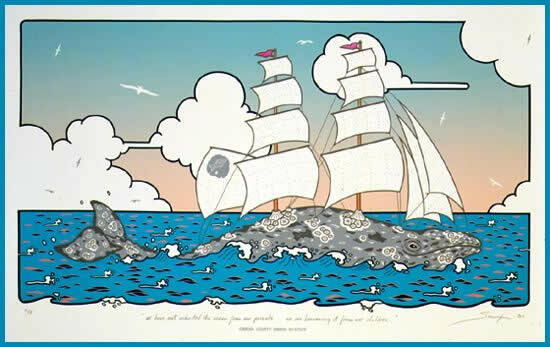 The Pilgrim Whale, an original serigraph by Monterey, California artist Jeffrey Sax, was designed for the Orange County Marine Institute to commemorate the second annual Bon Voyage Party for the brig Pilgrim, in anticipation of the 1989 Tall Ship Festival. Sax, whose works have hung alongside those of Picasso, Andy Warhol and Cheret in museums as well as private collections, was commissioned by the Sand Dollar Guild. He was asked to create a hand-painted serigraph depicting the union of the Pilgrim with the California Gray Whale. The motto projected: "We have not inherited the ocean from our parents, but are borrowing it from our children." Jeff Sax's six-color, numbered and signed serigraph successfully reflects whale power united with the spirit of the Pilgrim to help teach students respect for marine life and the necessity of preserving all of its forms. 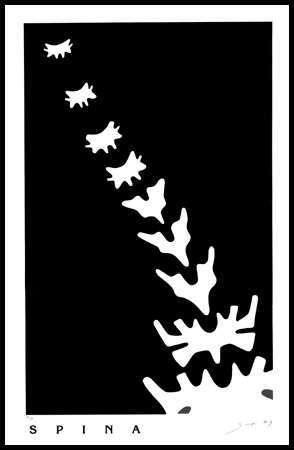 Printer: Art & Silkscreen Co. 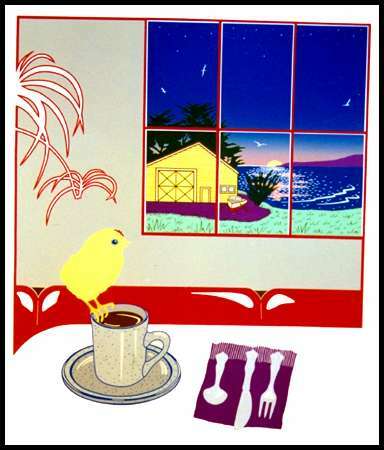 The First Watch serigraph was commissioned by John Sullivan for his breakfast resturant of the same name. It features a young rooster on a cup of coffee crowing as the sun goes up. In every way, every day is a new beginning. In the background is the historical Boatworks building surrounded by the lovely Monterey Bay. As we get older, the spine has a tendency to settle or contract causing stooping, aches, and bad posture. This is a positive visualization of the "Expanding Spine". As you follow the motion of the vertebras, imagine your own spine stretching upward! 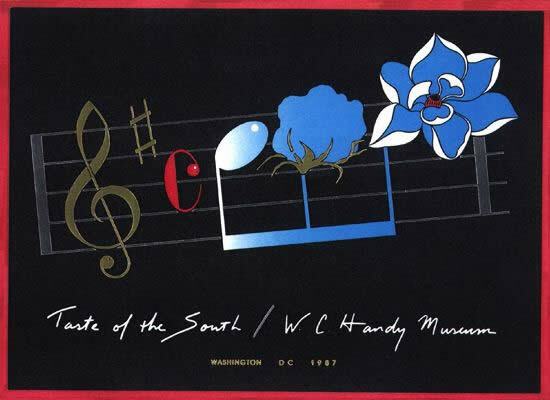 In 1987 Jeffrey Sax was commissioned by the "Taste of the South" to design the W.C. Handy commemorative poster. He was flown to Washington D.C. where he met Minnie Handy, the daughter of W.C. Handy who was very happy with the design. 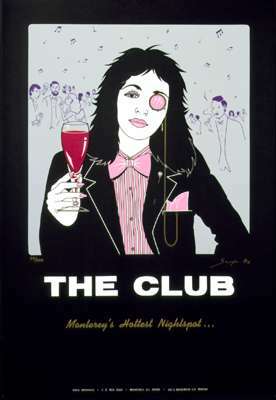 The money raised from the sale of the print was donated to the W.C. Handy Museum which was his old house in Florence, Alabama. The funds collected were used to refurbish the home to it's original state complete with his personal piano. This image depicts the first bar of music from W.C. Handy's famous work, "The St. Louis Blues". The first note represents music for music's sake. The second note signifies the agricultural south where Blues music was born. 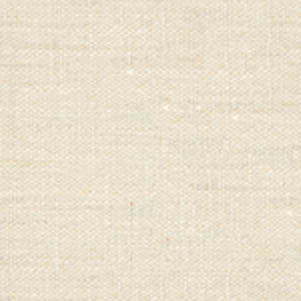 The third note is a magnolia blossom which epitomizes the famous southern hospitality and culture. Jeffrey Sax retained 100 prints for gallery and museum distribution.